Despite their current political dominance, Iran’s conservatives appear inordinately fearful of challenges looming in the June presidential election. Perhaps the most surprising is their concern that President Mahmoud Ahmadinejad may field a member of his inner circle against his former allies. Just four years ago, conservatives rallied to keep Ahmadinejad in office, despite unprecedented opposition during months of Green Movement protests. Now conservatives are dead-set on preventing the election of one of the president’s lieutenants. Now in his final five months in office, Ahmadinejad faces a constitutional limit of two consecutive terms as president. But he clearly would like to remain a defining political force from behind the scenes. Iranians often refer to his strategy as the Putin model, after the Russian president’s tactics used to orchestrate the election of Dmitry Medvedev as president in 2008—until Putin could run again in 2012. 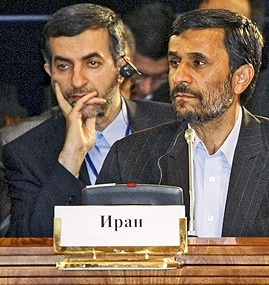 Over the past year, political speculation has centered primarily on Esfandiar Mashaie (left), Ahmadinejad’s principal aide, ideas-man and political adviser. He is widely considered to have formidable political skills; he is often credited with Rasputin-like influence over the president. The two men are also in-laws through the marriage of their children. Conservatives have countered with a campaign to discredit the Ahmadinejad team as the “deviant current,” trying to push the president and his lieutenants outside the political and religious mainstream. Mashaie is a particular target of the conservatives’ ire. Ahmadinejad’s ability to orchestrate a succession now seems extremely limited. He has lost much of his previous power as tensions between conservatives and his camp have escalated. The president fell afoul of Supreme Leader Ayatollah Ali Khamenei in 2012 when he tried to name his own candidate to the Intelligence Ministry— long regarded as the Supreme Leader’s prerogative. The president and the Majles also have daggers drawn over several major issues, most volubly on Iran’s troubled economy. The president barely disguises his contempt for parliament. In turn, the deputies, led by Speaker Ali Larijani, criticize Ahmadinejad’s policies and his ministers daily. They regularly issue dire warnings about the president’s alleged infractions of the law and the constitution. Ahmadinejad’s support from the Revolutionary Guards has long dissipated, even though he served in the elite military force during the eight-year war with Iraq. Guards commanders are now among his most vocal critics. Ahmadinejad’s vaunted subsidies reform program has cost rather than saved the government money, while the larger economy has suffered from the president’s misguided policies. The unorthodox religious views of the president and his team have alienated members of the clergy too. Ultimately, the Supreme Leader seems highly unlikely to acquiesce in the candidacy of Mashaie and, potentially, other Ahmadinejad aides. The Council of Guardians could also disqualify the president’s allies. Yet the president seems unfazed by his own isolation and the sometimes scathing criticism to which he has been subjected. His populist rhetoric and liberal welfare policies—and his readiness to thumb his nose at the high and mighty—have earned him favor with the rural and urban poor. And he still controls the interior ministry, which plays a role in running the elections. So a challenge to the conservatives by an Ahmadinejad-backed candidate still seems likely. Read Part I - Pivotal Election: The Conservatives.